A countrywide vaccination campaign is under way in Iraq following the country’s first confirmed case of polio in 14 years, but public health experts warn it will take more than immunization to beat the virus. Inadequate sanitation, contaminated water sources and poor public health systems are also major factors in the spread of polio, which - although easily preventable - is high contagious and incurable. “Putting all your faith in vaccination alone is putting all your eggs in one basket,” said paediatrician Annie Sparrow, assistant professor of global health and deputy director of the Human Rights Program at Icahn School of Medicine at Mount Sinai in New York City. “When people are still living in abysmal conditions that are unsanitary, unhygienic and with contaminated water, there will still be exposure,” she told IRIN. For Adam Coutts, an honorary research fellow at the London School of Hygiene and Tropical Medicine, the Iraq case says a lot “about the severity of poverty and state neglect of large numbers of the population as well as the decrepit condition of public health and healthcare services over the last 10 years in Iraq”. As IRIN documented in an in-depth series last year, the US-led invasion of Iraq in 2003 had a lasting impact on Iraq’s healthcare system. The UN Children’s Fund (UNICEF) said that in areas where poor sanitation, lack of hygiene and malnutrition were prevalent, additional awareness activities and sanitation drives would be carried out alongside the distribution of vaccines. This is the second country-wide immunization drive to take place in Iraq this year, following an earlier campaign in March in response to cases discovered across the border in Syria in 2013. More rounds are planned for May and June. "The problem is many countries in the region - not just Iraq - do not see public health as a key concern of human security or a driver of economic growth. " For every case of polio that results in paralysis, doctors estimate there could be as many as 250 other live cases of the virus. 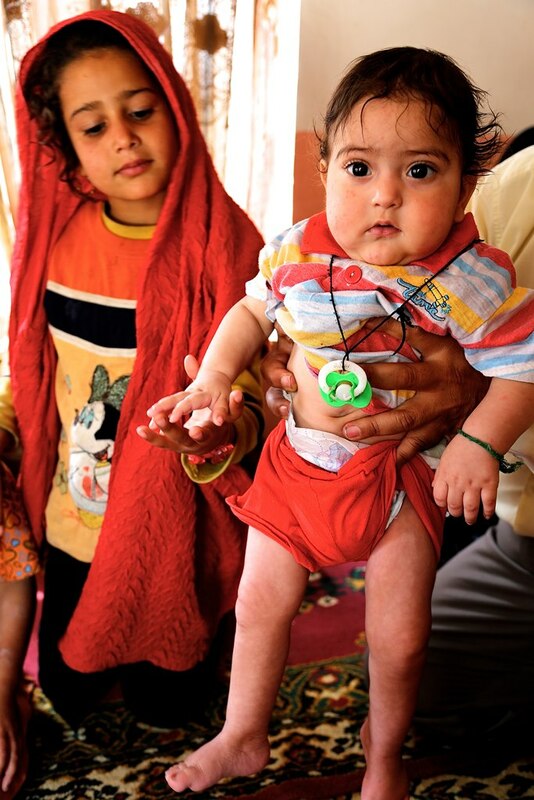 That means there could be many more polio cases in Iraq that remain undiagnosed. Due to the social stigma attached to polio, parents may not want to put their children forward for testing, Sparrow said. Doctors who have not seen polio for a while may not even understand or recognize the symptoms, she added. The parents of six-month-old Moossa Hezam, the baby boy at the heart of Iraq’s outbreak, did take their son to the doctor when he became ill, but his father told staff from UNICEF that neither Moossa nor his four siblings had been immunized. “I am working so hard to support my family and had no time to think about taking my children to the hospital for vaccinations,” Abood Hezam, a driver who lives in Baghdad’s impoverished northern suburbs, told health and nutrition officer Ali Abdul. “I truly regret this now. If only Moossa was vaccinated, he would have been polio-free now.” He added that he wanted to make sure all other parents knew the risk, so that their children would not be infected. Moossa’s polio matches the wild polio virus type 1 (WPV1) strain found in Syria, where to date 27 children have been paralysed. The virus reappeared in Syria in September after a decade without any cases. Health workers blame the resurgence on the civil war and the disruption it has caused to immunization activity and supply chains. Iraq faces similar challenges. With parliamentary elections due to take place on 30 April, political and sectarian tensions are rising. According to the UN Assistance Mission for Iraq (UNAMI), more than 2,000 people have been killed by acts of terrorism and violence since the start of the year. Separately, the western province of Anbar, which shares a border with Deir-ez-Zor, where Syria’s polio outbreak first occurred, has since January been caught up in fierce fighting between government forces, Islamist factions and other tribal militants. More than 400,000 people have fled their homes and the insecurity has severely restricted humanitarian access. As a result, the last polio vaccination drive held in the province in March reached less than half of its target. Ziad Tariq, a spokesperson at the Ministry of Health, played down the issue of poor sanitation and weak health systems, blaming the outbreak on the fact that insecurity within Iraq prevented all children from being reached in previous vaccination rounds. Some parents, he added, did not put their children forward to be immunized. But even before the most recent escalation in fighting, health workers struggled to ensure all Iraqi children received the three recommended doses of the vaccine. According to data from the World Health Organization (WHO), immunization coverage from 2009 to 2014 ranged from 70 to 87 percent of targeted children, and at times dropped to less than one-fifth of children in Diyala and Dahuk provinces. Syed Jaffar Hussain, head of the Iraq mission for WHO, which is leading the response in conjunction with the Ministry of Health and UNICEF, told IRIN that despite the “challenging security situation”, health workers planned to achieve “coverage of 100 percent” in this new round. He said the immunization campaign, which in the rest of the country ran for five days (from 6-10 April), would continue longer in Anbar to ensure full reach. The “catch up” campaign will ensure no-one was missed, he added. Public health a key priority? But accessing funding remains a major hurdle, according to UNICEF’s Babille. With money only guaranteed for the next few months, agencies are putting steps in place for a potential emergency appeal to respond to the polio outbreak. Babille, a medical doctor, said he hoped the government would follow up on its pledges to provide financial support to the polio response, especially given the existing strains on UN budgets. Critics have accused the government of being slow to put money towards the polio response. “The Ministry of Health has more than enough money to fund vaccination coverage and basic sanitation and hygiene infrastructure and they should see it as a cost-saving measure,” Coutts told IRIN. But Tariq, of the Ministry of Health, insisted the government is funding the immunization campaign, with technical support from UNICEF and the WHO. Following Moossa’s diagnosis in March, there has so far only been one other suspected case in Iraq: a young refugee girl who crossed the border from Syria into the semi-autonomous Kurdistan region. She was later found to have temporary vaccine-induced paralysis and has since made a full recovery.